November is a stressful time for university students, no matter which year you are in! Most of us have multiple assignments and because of the dreary weather outside, motivation may not be at the highest! To make sure you are able to get through all your work-load and stay full for longer, I thought of doing this easy bake recipe as its filling and a perfect dinner to pick you back up again after a long day of studying. I have added chicken in my recipe but you can omit this and just stick to the vegetables and rice if that’s your dietary preference. So lets begin! Start prepping for this recipe by taking 2 chicken breasts and cutting them both through. This way, you will end up with 4 pieces of chicken breast and because of reduced thickness, they will cook thoroughly. Once you’ve cut your chicken breast put them on a greased pan and drizzle a generous amount of olive oil on both sides. After this, you can sprinkle on your choice of spices and herbs. I added some chilli flakes, paprika, salt, pepper and garlic seasoning. In addition to that, I also squeezed juice from half a lemon. Lemon is my secret ingredient in most of my recipes as it adds a beautiful burst of freshness and helps meat to tenderise in the cooking process. After that, I massaged the chicken and kept it on the side to soak up the marinade. Now, if you’re making this dish meat-free, its even quicker for you! Start of by slightly greasing a pan and add in chopped vegetables of your choice. For this recipe I recommend carrots, bell peppers, onions, sweet potato, green beans and broccoli; you can even add corn! 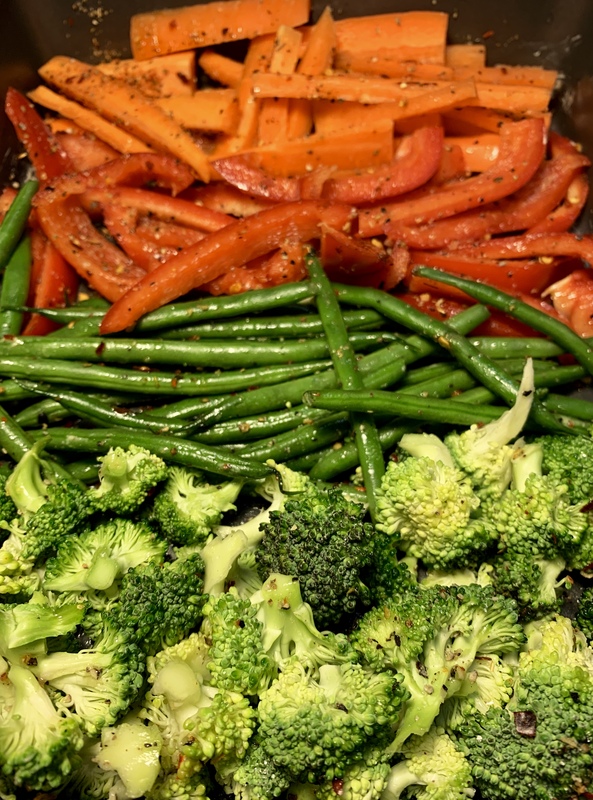 Next drizzle on some olive oil, salt and pepper on to your vegetables for a nice kick! Once your chicken and vegetables have been prepped, pop them in the oven for about 15-20 minutes until you are happy with how well they are cooked. While these are cooking, you can start on your rice. For a cup of rice, you want to boil 2 cups of water. Once it starts bubbling, add a cube of either vegetable or chicken stock, some salt and a mix of herbs to the water and mix it well. To this add your rice and let it cook on medium/low heat until the water has fully absorbed and the rice are fluffy! 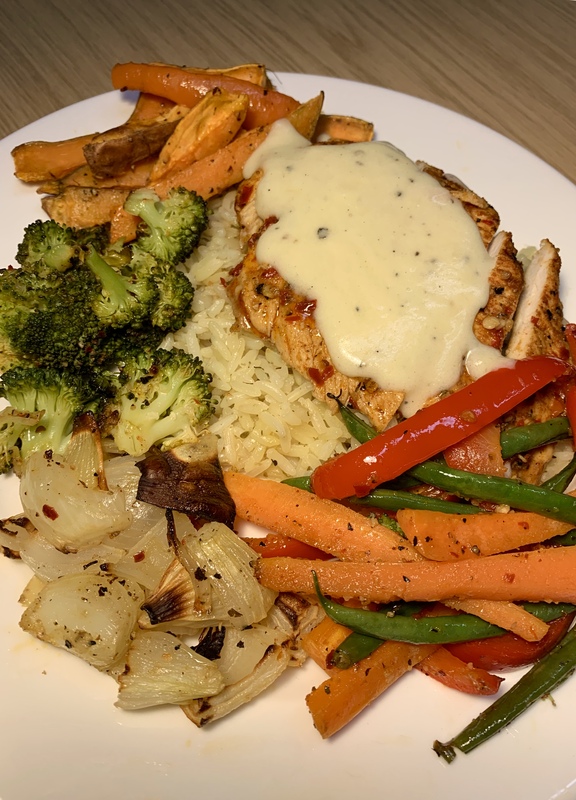 You can leave the recipe at this and it will still turn out amazing, but I went ahead to make some cheesy white sauce to pour over the chicken for extra deliciousness! For the white sauce, in a small sauce pan add 1 tablespoon of butter and let it melt, next add one table spoon of flour and give it a good mix. After this, add the milk (I usually eyeball it and add as much as I want until I get the preferred texture). Once a sauce has been created, add some salt, pepper and cheese to complete! Once your rice, chicken, veggies and white sauce is complete you can serve and enjoy! This recipe is great for meal prep and really filling! Perfect for the cold days ahead. ← Why Working with Kids is the Best Student Job.